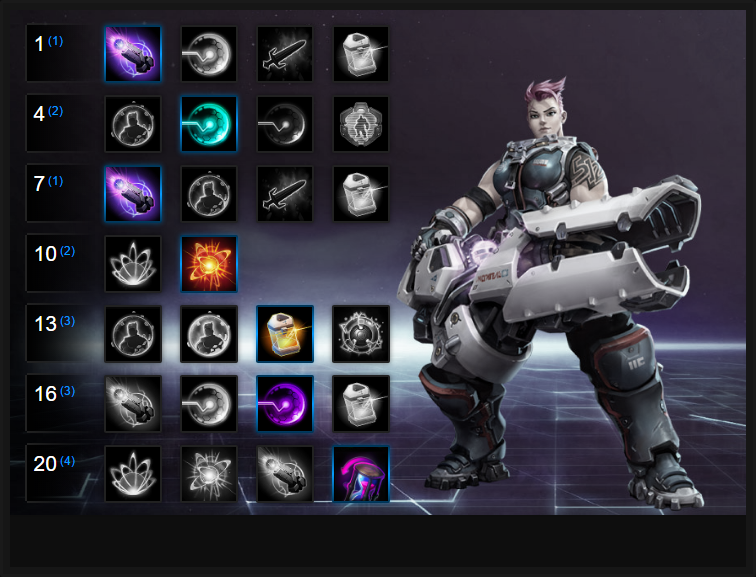 In this Zarya Build Guide, we provide an overview of her strengths, abilities, talents and matchups. Zarya is a ranged warrior that brings damage and amazing shielding to a team. Although she lacks hard crowd control such as stuns or slows, she makes up for this in the fact that she's incredibly tough. With her Energy mechanic and once she's in the thick of a fight, her damage is amazing and her range allows her to pressure most enemies from afar. Her being ranged does bring its own problems however, specifically that she isn't technically a front-line tank. Despite that, with the right choice of talents and based on the lower range of her basic attack, she can get into the scrum of any fight and survive for long periods. With an enormous shield (see below) and if being looked after by a Support Hero such as Lt. Morales or Malfurion, she can withstand a huge amount of pressure. Energy (Trait) - Energy is a simple Trait that despite a lengthy tooltip is easy to understand: when shielded, if Zarya or an ally take damage, Zarya's damage will increase. Each point of Energy Zarya has (as indicated on her HUD or above her head) she'll see her damage increase by 2%. Effectively, you want as much Energy as often as humanly possible. You achieve this by not only timing your shielding so that you take damage (and thus boost your damage) but to also shield an ally who's being attacked (to further boost your damage). For maximum upkeep of your Energy you need to only use your shield when you or an ally will take damage - use of them any other time is, arguably, a waste. Particle Grenade (Q) - As your only means of ranged poke, Particle Grenade is surprisingly annoying. With 4 charges, it fires far and allows Zarya to gun down enemies before she arrives into a fight or when enemies are trying to flee. My best advice is to try to save as many charges of Particle Grenade as you can, as it takes 8 seconds for each charge to return. When a low health enemy is escaping, you'll often need all four to be able to bring them down (or at the very least a couple). At the start of a team fight (if you're arriving into one) it's also a good idea to launch two Particle Grenades at the back line to instantly pressure the support/ranged heroes. Personal Barrier (W) - Providing you with a large shield, Personal Barrier only lasts for 3 seconds. However, despite its limited window its more than enough to give Zarya a huge amount of defence and considering its relatively short cooldown, across sustained fighting she can use it multiple times. The fact it provides so much shielding unsurprisingly makes Zarya especially tanky and in 1 on 1 situations, Personal Barrier can be hard for opposing Heroes to break through. Just be sure to use it when damage is aimed at you to maximize your Energy gain. Shield Ally (E) - Acting exactly the same as Personal Barrier, Shield Ally allows Zarya to cast a defensive shield arround any ally. Once again it lasts for 3 seconds and although its value is a little lower than the Personal Barrier, it's still an enormous shield. Be sure to always cast it on an ally that's being focused as it'll ensure a huge return on your Energy gain - especially if also used at the same time as your Personal Barrier. Graviton Surge (R) - Both of Zarya's Heroic abilities are strong, but I would argue Graviton Surge just pips Expulsion Zone for certain situtations. Providing an AOE pull that draws enemy Heroes into its center, Graviton Surge can be used very aggresively if your team has lots of AOE damage. It can comfortably secure multiple kills and if timed right, can wreck enemy teams. Simply line it up and have all your team attack the area once it's active. Just be aware that by default, it doesn't deal damage and has a huge cooldown. Expulsion Zone (R) - Providing a great deal of control and utility, Expulsion Zone is a fantastic ability on objective based Battlegrounds. Not only does it block enemies from passing through the area, but it also knocks them back and reduces their speed by 1 second. For preventing an escape by the enemy - say, through a Keep door - it's invaluable. If you place it correctly you can gaurentee the enemy team won't be able to leave and if your team is already pushing hard, a wipe soon comes after. Demolitions Expert allows Zarya to complete a quest that lowers the cooldown of Particle Grenade by a maximum of 4 seconds (effectively halving the recharge rate). Every 5 enemies hit lowers the cooldown by 0.4 seconds. In addition, completing the quest (hitting 40 heroes) its radius is increased by 15%. Variable: Feel The Heat increases Zarya's basic attack damage by 50% when in melee range of an enemy. By default, Zarya doesn't hit too hard but when she has a high amount of Energy, her basic damage can be enormous thanks to this Talent. Just be sure to get into the thick of a fight once your Energy is high to maximize it. Another quest, Give Me Twenty increases Shield Ally amount by 15 up to 300. In addition, collecting 20 Regeneration Globes also lowers its cooldown by 2 seconds. It provides much more protection for your team mates. Variable: Zarya relies entirely on her shielding for not only survivability but damage and Energy gain. Improving the damage her Personal Barrier can withstand not only ensures she can survive longer, but also boost her Energy quickly based on incoming damage. I Am The Strongest is a good variable for building on what's already an incredibly strong ability. If you're taking Graviton Surge (see below) taking Pin Point Accuracy is a great choice. It boosts the center damage of Particle Grenade by 40% and across three shots, when enemies are trapped in one place, it's a huge amount of damage output (especially if your Energy is high!). Variable: Zarya needs Energy to be a constant threat, so gaining 20% extra Energy from damage when shielded is significant. Hit Me isn't a manatory talent, but it is a very good one that'll quickly boost your total Energy in a fight. On Battlegrounds with lots of tight corridors or where fighting often happens in confined spaces, Expulsion Zone is amazing. If placed correctly it can gaurentee enemies are unable to escape, or it can comfortably protect your team from being attacked. Variable: Bringing control and huge amounts of team-spike potential, Graviton Surge is fantastic in a team fight. It's also an excellent ability for defending yourself should you need to. Simply drop it at your feet and watch your attacker get pulled in - more than long enough to run away. 75 Energy is easy for Zarya to obtain and once she has, Endurance Training reduces all damage she takes by 75%. During a team fight, you'll rarely go below this figure and when combined with your shielding, makes Zarya incredibly tough to bring down. As a Tank it's your role to protect your team and while your Shield Ally is exceptional, having two is far better than one. When you cast Shield Ally on a team-mate, it'll quickly bounce to another on impact. Your Energy gain is combined across your Personal Barrier as well as both active ally shields. Gain Train offers a huge amount of team mitigation. Although Unyielding Defender has a long cooldown, it's well worth taking. It'll allow you to reset your shield abilities instantly, providing double of both. Considering Gain Train also allows Shield Ally to bounce, double the amount of shielding becomes a huge nightmare for the enemy team. If you time it right, you should also have this active ability ready for every team fight. These Hero Threat Levels (1 being lowest threat and 10 being highest threat) are to help you determine which enemy Heroes can give you a headache. For the Heroes listed here, take extra care as they're particularly dangerous for Zarya. Lunara: Her mobility, nuisance poison and vision make her a challenge for Zarya. You'll not be able to really hit her with her basic and she can comfortably avoid your Particle Grenade. Thrall: His root, ranged poke and self healing are very difficult to deal with. Even with your shielding, he'll he'll cut through it quickly. The Butcher: Onslaught and Lamb to the Slaughter can destroy you near instantly. There's absolutely nothing you can do against him besides use your Personal Barrier. Greymane: He has the burst potential to kill you incredibly quickly if he switches to Worgen form, while having his Ultimate ability ready. He might not be as much as a threat as he once was, but if you've no Personal Barrier available you're in trouble. This list of tips and tricks are just a handful of things we think will help your Zarya play. We'll continue to add to the list as required and if you have any tips you'd like to share, let us know in the comments below and we'll place them here. 1. Zarya relies heavily on her trait to maximize her damage. Use your shields only when you're about to take damage. 2. Try to always rotate your Personal Barrier and Shield Ally so that you have a constant intake of Energy from when the enemy attacks the shields. 3. Particle Grenade has four charges that recharge slowly over time. Ensure you have all three ready for team fights (especially on objective based Battlegrounds). 4. Even though Zarya is a ranged Tank, her basic attack range is relatively short (slightly longer than melee). When you need to, don't be afraid to get up close and personal in order to body block. 5. Your basic attack cuts through targets - always aim for the furthest enemy so that those in between also take damage. 6. Always use Shield Ally on a high value target that's under pressure. It'll save their life. 7. Either Heoric ability is great for Zarya. Depending on the composition of your team, choose one or the other (Graviton Surge works best with AOE based teams). 8. Expulsion Zone is amazing if used at the entrance of a Keep. It'll prevent enemies escaping and ensure they die to your team. 9. Zarya can comfortably solo most enemy Heroes 1 on 1. Your shielding plus raw damage pretty much ensures this. Don't be afraid to bully when in lane. 10. Try to kite or back off a little when your Personal Barrier is on cooldown. If you have a healer with you, you can afford to be aggresive but try to find the balance between offensive and defensive play. 11. Always shield an ally who is under immediate pressure. The shielding will save their life and reduce the need for your Support to use a Heroic or healing ability to keep them up. 12. Save Unyielding Defender (level 20 active ability) until a team fight. It's too good to waste as it grants double shielding to you and allies.